It’s strange to me that of all the retro gaming characters that have seen updates since their initial conception, that Pac-man, our favorite gluttonous yellow orb, has mostly been forgotten. He was given a girlfriend in the early 80s and at a certain point Midway stupidly decided to release the abomination of a game Professor Pac-Man, a poor attempt at capitalizing on the familiar face and suggestive that Pac-Man had a propensity for continuing education. Nevertheless, I’ve yet to see any interesting or creative reinventions. I suppose I don’t really know what I’m hoping for. I mean – if Pac-man were to logically “progress”, then a backstory would have to be created for him, a story that would invariably be existentially depressing (Pac-man is trapped in an endless series of mazes wherein he is chased by ghosts that regenerate even on the off chance that he is “pumped” enough to eat them. Also, his only consolation is the occasional fruit). In any case, today – I was proven wrong. 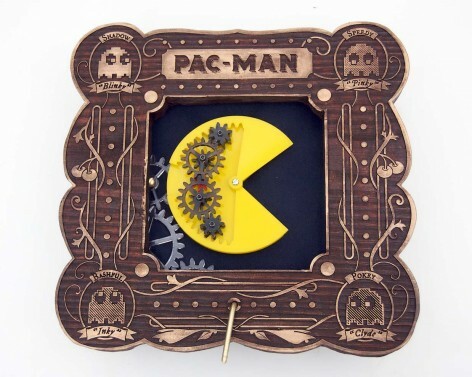 In his video, Jonathan M. Guberman unveils a hand-crank operated Pac-Man, a magnificent mechanism he likes to call “The Pactuator” that is only the starting piece in what he hopes to be an entire game called “Pac Machina”. It’s hard for me to conceive of how this game might actually turn out (my brain is very small) but this cool little prototype has definitely got me intrigued. As a matter of fact, I would even be satisfied if this was the end product. 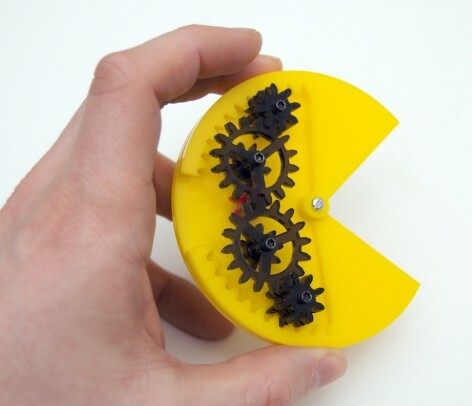 According to Mr. Guberman’s website, the mechanism fits entirely inside Pac-Man’s profile and involves the “transformation of a continuous rotary motion (the crank) into an oscillating rotary motion (the mouth)”. The end result is a smooth and streamlined opening and closing action, perfect for eating all those pixelated dots. Mr. Guberman built a beautiful frame to contain the glory that is his first prototype and even it looks awesome. My future children would make me proud if they undertook something like this for a science project.